New research shows flu can spread through respiration more easily than we thought. We all know the guidance to avoid getting sick during flu season: Try not to touch your face or other stuff, wash your hands often and, most importantly, don't cough or sneeze without covering up. But new research shows how mere breathing can spread the flu. 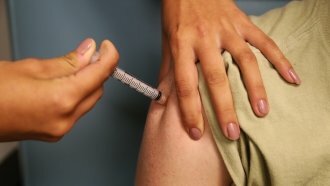 Scientists at the University of Maryland measured people with flu infections while they breathed, talked, coughed and sneezed. They found simply breathing in and out is enough to lace the air with the flu virus. This means people can transmit the flu through the air more easily than previously thought. Most health officials thought the virus spread mostly through coughing or sneezing, but this new research suggests those explosive events aren't required. Researchers also found that flu breath is most infectious in the early stages of illness. They recommend the same things world and national health organizations do: If you're sick with the flu, stay home.